Outline: Story of the healing of blind Bartimaeus. People who are in sin are in darkness like he was. Come to the Light. Bartimaeus: "For God's sake, give me some money!" Passer-by: "The Lord Jesus is passing by today. People say He is the Son of God. He does amazing miracles -- heals the sick, makes the lame walk, opens the ears of the deaf and casts out demons. Many people follow Him." Bartimaeus: "If Jesus can do all those miracles, surely He can open my eyes!" Bartimaeus: "Lord Jesus, have mercy on me!" Passer-by: "Keep still! Don't bother the Lord Jesus." 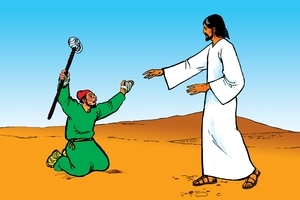 Jesus: "Bring the blind beggar to me." Passer-by: "Have courage! Get up! The teacher is calling you." Jesus: "What do you want me to do for you?" Bartimaeus: "O Lord, please open my eyes!" Jesus: "Receive your sight. Your faith has made you whole (healed you)." Narrator: Immediately his eyes were opened. For the first time he saw the light. He looked into the face of the Lord Jesus. He loved Him and decided to follow Him. His life was completely changed, for now he walked in the light. Friend, are you like blind Bartimaeus? Listener: What do you mean? I am not blind! Narrator: When greed, envy, enmity and lying come into our lives, they make us blind. We walk in darkness. Could Bartimaeus heal himself? Listener: No, he had to come to the Lord Jesus to be healed. Narrator: Yes. And it was necessary that he leave his darkness. Listener: That is not difficult. Everyone wants to get out of darkness into the light. Narrator: No, that is not true. God's Word says, "The Lord Jesus came as light into the world. But men loved darkness rather than light because their deeds were evil." Have you ever seen termites? Listener: Yes, I've seen them. Narrator: What do they do when exposed to light? Listener: They look for a dark place in which to hide. They work in darkness for their work is evil. They destroy the wood in our homes. Narrator: In this same way we love our sinful lives. Jesus wants to bring us out of darkness. He wants us to walk in the light. But too often we would rather stay in the darkness. Blind Bartimaeus was not like that. When he saw the light, what did he do? Listener: He followed the Lord Jesus and served Him. Narrator: That's right. the Lord Jesus wants us to come into the light and follow Him. Are you ready to come into the light? Listener: Yes. I don't want to walk in darkness and sin any more. I want to walk in the light of the Lord Jesus.